DCU's Shane Carthy, playing for Dublin. Credit: David Fitzgerald/Sportsfile. 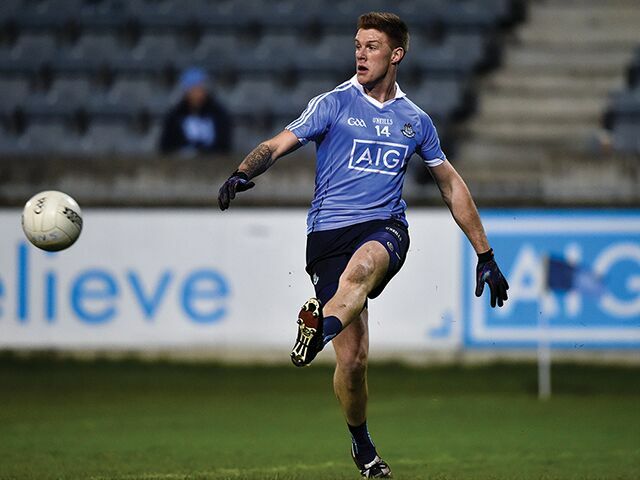 Niall Moyna’s DCU advanced to the Quarter Finals last Wednesday after a battling 1-07 to 0-07 over Dundalk Institute of Technology to set up a clash with old foes UCD in a repeat of the 2016 Sigerson Cup Final on February. Dublin and DCU footballer, Shane Carthy is just one of several who played in UCD’s 0-10 to 2-2 triumph in Jordanstown two years ago. The Naomh Mearnóg midfielder is keen to right the wrongs of that defeat and even though the vast majority of players on both sides have moved on, feels there is still lessons to be learned. “We would look back to learning from that game, I know it’s been a couple of years now so obviously in terms of personnel it’s a bit different, philosophy certainly. From what we understand and see has stayed the same with UCD and possibly for ourselves,” Carthy told The College View. “With the (inter-county level) league this weekend, it’s about the lads getting over that and making sure that any knocks and niggles are cleared by Monday and start reviewing it from there. It’s a kind of hectic period during Sigerson (Cup) and League but from Monday onwards we’ll dig in and see what we can expose of them and I’m sure they’ll be doing the same,” he said. Preparation hasn’t been ideal; third level institutions in Leinster did not take part in the O’Byrne Cup. The O’Byrne Cup in the past had provided third level teams a chance to play competitive games in early January in the build up to the Sigerson Cup. The lack of the competition is something Carthy feels has been difficult for DCU but is also somethig has allowed some inter county players impress their county managers in pre season. “It’s the first time in I don’t know how many years (that Leinster Colleges were not in the O’Byrne Cup). Our last competitive game was in November, so naturally enough you want to get the lads together for competitive games, there’s only so much training you can do,” he said. Perhap’s for this reason, DCU narrowly avoided a first round scare against DkIT. An impressive display from Éanna Ó Conchuir that saw him score 1-3 of DCU’s 1-7 in a ‘patient’ display according to Carthy; “From our point of view, we had to stay patient. We knew they were going to be resilient from the very start and we knew gaps would start appearing as they did in the second half.,” he said. “With Sigerson (Cup), it’s always going to be tight regardless of who you play. We knew that as well coming into the game that going away to Dundalk was going to be tough.